Rima Fujita was born in Tokyo, lived in New York City for thirty-two years, and now resides in Southern California. She graduated from Parsons School of Design with her B.F.A. and has exhibited her work internationally to much acclaim. Rima has collectors around the world including many high-profile clients. As a descendant of the Last Samurai her creative aesthetics is strongly influenced by the philosophy of Bushido and Buddhism. As a contributing artist for a popular cultural television program, “At the Garden of Wordsworth” and “Adventure of Wordsworth” for four years, Rima’s work became renowned nationwide, and she showed over 500 works on a national network throughout Japan. As a prolific full-time artist she has produced over 1,000 pieces in the last twenty years. Rima’s life passion lays in her philanthropic work. In 2001 she established “Books for Children,” an organization that produces children’s books and donates them to children in needs around the world. She has created 4 children’s books and has donated more than 12,000 books to the Tibetan children in exile. All profits go to support the Tibetan children’s education. H.H. The Dalai Lama, Desmond Tutu and Betty Williams, the Nobel Peace Laureates personally gave her special recognition in 2006 at the International Peace Summit in Japan. His Holiness The Dalai Lama calls her, “An artist who creates beautiful art.” Rima has won various awards internationally. Her recent solo-exhibitions were held at Sundaram Tagore Gallery in Beverly Hills, L.A. 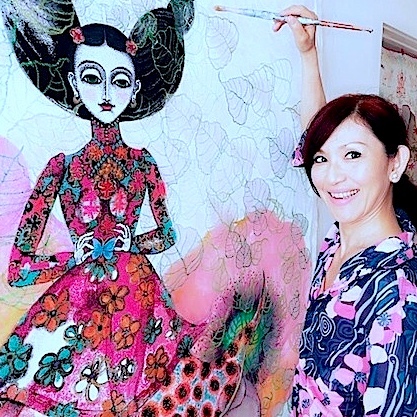 Trace Foundation, New York and Isetan Art Gallery in Tokyo, Japan where she has exhibited her work every year for the past twenty years. Selected clients include: Chanel, Cartier, Shiseido, World Wildlife Fund, Asia Society Museum, Rubin Museum of Art, Isetan, ABC Carpet & Homes, Veuve Clicquot, IKT and more. Selected publications include: Vogue, ELLE, Cosmopolitan, Glamour, Marie Claire, 25 anns, Spur, In Style, Fuji Sankei Television, TBS Television, NHK, Asahi Newspaper and more. Documentary films made by: NHK, TBS Television and others. Awards: Excellence in Media Award 2008, IP Award 2008 and Giorgio Armani Cultural Award 2001. Kee Magazine This is an interview article in Kee Magazine, the newest issue.